"I’m a former Black Panther," Rollins said. "And when we talked about the movement, as a former Black Panther with Angela Davis and Kathleen Cleaver, it was important for us to make people understand that it was about the movement for us, educating us." "Mass incarceration did not just happen in Republican hands," she said, adding a range of other issues including police brutality and charter schools. "We’ve got to be out here in masses in the midterms if we want to change this country because it’s all about changing the Congress now," she said. 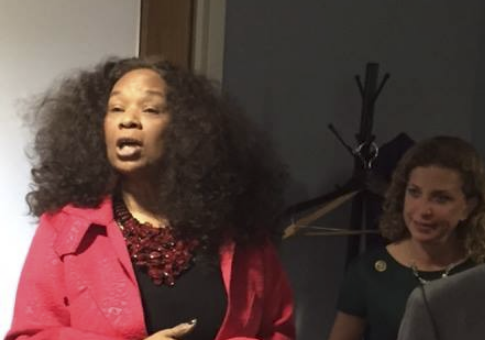 "They [Democrats] cannot win without black folks and women, so it’s up to us," she added. "We’re going to do grassroots organizing in this election," Rollins closed. "That is so important." "We’ve got to turn back to the revolution because it’s important," she said. "They depend on us." This is not the first time Rollins has brought up her connection to the Black Panthers. In 2016, the Michigan Chronicle quoted her describing how she was "all into" the Black Panthers marching with guns when she was younger.